An abscess is a localization of pus on any part of the body with pus being extravasated white blood cells. The presence of pus means that the body is or was fighting an infection. Abscesses may have the symptoms of fever and swelling. An abscessed tooth is associated with an infection pertaining to a tooth. There are different types of abscesses. A soft tissue abscess around a tooth doesn’t necessarily mean that the tooth is infected. The accumulation of plaque and calculus around a tooth may cause the gum or gingiva to become infected. Poor oral hygiene, periodontal disease, and even tooth eruption (particularly wisdom tooth eruption) can cause this type of soft tissue abscess. The treatment is generally oral hygiene instruction, periodontal scaling, root planning, and in the case of wisdom teeth, antibiotics or extraction may be necessary. 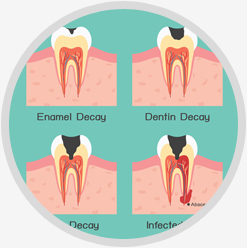 When we refer to the term “abscessed tooth”, it means a tooth where the pulpal tissue has become infected after necrosis, and the apices or end of the tooth structure connecting to the supporting bone has an area of infection. An abscessed tooth of short duration may result in what is called an acute abscess which may be symptomatic but not visible to a dental x-ray. The patient however may be in mild to severe pain, with extraction or endodontics (root canal therapy) being the treatment with antibiotics and analgesics. A chronic abscess is clearly visible from a dental x-ray, with extraction, endodontics, antibiotics, and analgesics being the treatment. Sometimes incision and drainage of the soft tissue associated with the dental abscess may be necessary. 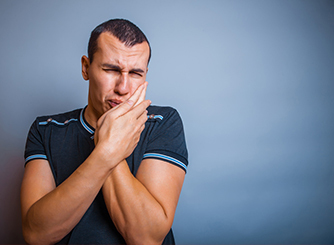 Left untreated, an abscess tooth may result in a life-threatening dental emergency, where the infection spreads along facial space or planes, resulting in a compromised airway. The treatment for an abscessed tooth should be sought immediately.